Paracoccidioidomycosis ceti is a cutaneous disease of cetaceans caused by uncultivated Paracoccidioides brasiliensis or Paracoccidioides spp. 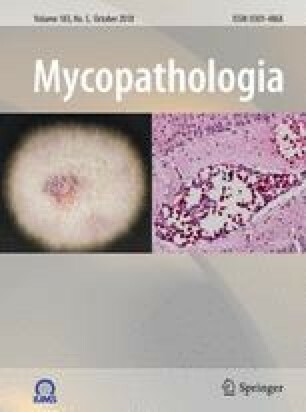 Serological cross-reactions between paracoccidioidomycosis ceti and paracoccidioidomycosis, paracoccidioidomycosis and histoplasmosis, and paracoccidioidomycosis and coccidioidomycosis have been reported before. The present study aimed to detect immunohistochemical cross-reaction between antibodies to Paracoccidioides sp. and Histoplasma capsulatum, and vice versa. Thirty murine sera, obtained from experimental infections of 6 isolates of H. capsulatum, were reacted with paraffin-embedded yeast-form cells of Paracoccidioides sp. derived from a case of paracoccidioidomycosis ceti in Japan. The murine sera were also reacted with human isolates of H. capsulatum yeast cells, with P. brasiliensis yeast cells, and with fungal cells of Coccidioides posadasii. Three dolphins’ sera from cases of paracoccidioidomycosis ceti, two human sera from patients with paracoccidioidomycosis, and a serum from a healthy person with a history of coccidioidomycosis were used in order to determine that the tested fungal cells reacted properly. Sera derived from mice infected with an isolate of H. capsulatum reacted positively against yeast cells of Paracoccidioides sp., yeast cells of P. brasiliensis, and fungal cells of C. posadasii, while those derived from other strains were negative. The present study recorded for the first time the cross-reaction between the yeast cells of H. capsulatum and antibodies against Paracoccidioides spp., the yeast cells of Paracoccidioides sp. and antibodies against H. capsulatum, the yeast cells of Paracoccidioides sp. and antibodies against Coccidioides sp., and fungal cells of C. posadasii and antibodies against Paracoccidioides spp. Handling Editor: Anamelia Lorenzetti Bocca. We are grateful to Drs. Katsuhiko Kamei and Shahana Sharmin (Medical Mycology Research Center, Chiba University, Chiba, Japan) for allowing the usage of serum samples, and to Drs. Kazuko Nishimura (emeritus professor of Medical Mycology Research Center, Chiba University, Chiba, Japan), to Makoto Miyaji (late emeritus professor of Medical Mycology Research Center, Chiba University, Chiba, Japan), and to Kunie Iabuki Coelho Rabello (emeritus professor of Department of Pathology, Faculty of Medicine, State University of São Paulo, Botucatu, Brazil) for the paraffin-embedded tissue samples. This work was partially supported by JICA Grant No. J17-50165 awarded to Drs. Ayako Sano and Luciene Airy Nagashima. We would like to thank Editage (www.editage.jp) for English language editing. The authors declare no conflicts of interest. The authors alone are responsible for the content and writing of this paper. The usage of human sera was permitted by the ethic committee of University of the Ryukyus, No. 383 approved on November 24, 2017. Animal sera were derived from clinical samples, or previously permitted experimental infections, with permission No. 20020018 from Chiba University; therefore, our work did not qualify as an animal experiment according to the animal welfare committee of the University of the Ryukyus.